Winter Cycle is Flat 12's annual release that coincides with their anniversary party. This year's release will be the 3rd edition (I can count!) 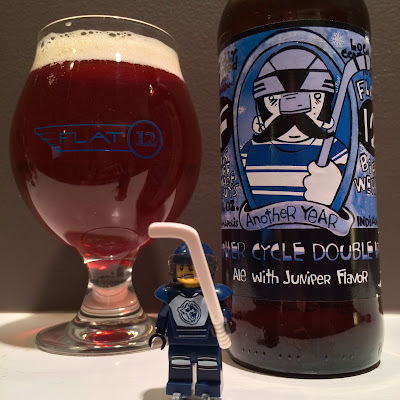 of this big (9.3% abv) hoppy (107 ibu) beer. To be exact this is a double IPA, with "6 hop varieties from 3 continents and "it's like Half-Cycle's pissed off viking cousin." according to Flat 12. Winter Cycle is only available in the taproom and is sold in 4-packs. This is the first year that I've gone to the party or purchased Winter Cycle, but it always seems like this is a release that flies under the radar. Maybe the epic-ness of the party overshadows it or maybe it's because most Indianapolis beer releases outside of Sun King tend to be quiet events, whatever the case I wanted to make sure I grabbed some before starting in on the rare party offerings. Into the glass this pours a cloudy reddish-orange with a 1-finger beige head. There's lots of suspended particles that hang out in there (as you can see in the picture), and leaves nice lacing as you work your way through the beer. Aromas of onion, juniper, and grapefruit smack you in the nostrils. Much of the same notes are in the taste along with honey, biscuit malts, and a finish of grapefruit and earthy bitterness- yep this is Half Cycle's angry viking cousin all right. This is medium-bodied, with not much carbonation, and a dry finish. 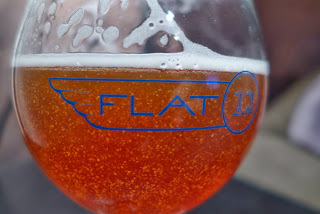 Happy Anniversary Flat 12 Bierwerks!